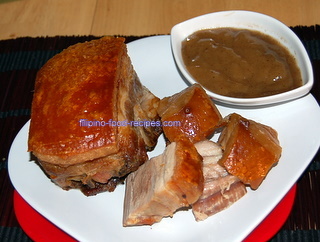 This Lechon Kawali recipe makes a whole slab of fried pork belly turned into a delicious pork dish with crisp, crackling skin with salty exterior and tender and juicy inside. It is usually served with a side of Lechon Sauce. Pork Belly is that only part of the pork that is used for this dish, the same part used to make bacon. Because of the good amount of fat on this cut, the meat does not dry out during the cooking process. Ideally, the procedure calls for the pork belly to be boiled until tender, and then sun-dried for 3-4 hours before deep-frying. Sun-drying will result in nice crackling skin. However, for food safety reasons, I don't suggest sun-dying or even exposing the meat to temperatures between 41 and 140 degrees Fahrenheit (the danger zone, they say) - even if it's already been pre-cooked. Certain meats that have been cured with salt or other curing solutions are safe to air-dry or sun-dry, like Beef Jerky, Tinapa or Tuyo. To get a nice crisp skin, an option is to freeze the pork after it's been boiled. This can give the same crackling skin effect for the Lechon Kawali - but please see Cook's Tips below on Safety during cooking. 2 Turn the heat down, add the onions, salt and peppercorns and simmer for 20-25 minutes or until the pork is tender. 3 Scoop out the pork and pat it dry with paper towel before deep-frying. (Or you can wrap it and freeze for frying at a later time). 4 Heat up the oil on your deep-fryer. The temperature setting should be 350 degrees Fahrenheit. Deep-fry for 15-20 minutes or until the skin is nice and crisp. 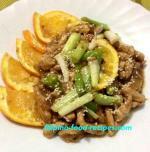 5 Serve with rice and Lechon Sauce. If your cooking pot is not big enough, you can cut the slab of belly into about 3 inch cubes, Don't cut any smaller because the lean part of the meat gets cooked faster than the skin, making it dry and a little tough. Ever had a Lechon Kawali that's bland and the meat inside still smell and taste like raw meat? I believe that secret to a good Lechon Kawali recipe is in the flavor that you put into the broth while you are simmering the meat. I like a lot of onions to cut the raw, fresh taste, and I sometimes add garlic, too. For seasoning the pork before deep-frying, you can use Garlic Salt or even the Goya Brand Adobo Seasoning, which is a mixture of garlic, oregano and different seasonings. Safety in the kitchen should always be your number one concern and deep-frying can be pretty dangerous so take the necessary precautions. Remember that water on oil can cause splatter - thus, a frozen pork belly placed on heated oil can splatter a lot. So, have a heavy pot lid and a long pair of tongs handy. Also if you can work with oven mitts covering your hands while frying, that can help you from getting oil splatter burns on your hands... and please, be very careful.